The 'On What You're On' trio - comprised of Charlie Simpson, Matt Willis and James Bourne - performed at Isle of Wight Festival this year and are keen to play the legendary music extravaganza held at Worthy Farm in Somerset, South West England. Speaking exclusively to BANG Showbiz, bassist Matt said: "We would love to play that place. That is always a bucket list thing. We would definitely not say no." Singer Charlie, 31, admits that when they were in talks for IOW the organiser, John Giddings, was unsure what kind of audience they'd bring in, but they ended up performing to one of the biggest crowds of the weekend. Charlie admitted: "If you look at Busted 10 years ago, Isle of Wight Festival organiser [John Giddings] wondered what sort of audience we would land and the crowd went off." Meanwhile, the 'Year 3000' hitmakers have said that while they are definitely planning on releasing another album, they can't predict what the future holds for them as a band, although they will always continue making music in some form. Asked if Busted are back for good, Matt, 33, said: "Who f***ing knows? At the moment, it's brilliant. We are definitely making another record together and we love being in this band, but we are not married." Charlie said: "We are in a position where we can do other stuff in the future as well and still be able to do this." And Matt added: "None of us are at a point in our lives where we are like, 'don't you f***ing leave'. We are all happy and content in this band. We are only 33 and Charlie is 31." 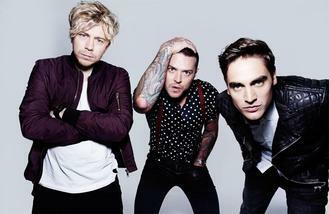 Busted's album 'Night Driver' is out now and the band head out on a UK tour in January.